AVA Amphitheater, 5655 W Valencia Rd. As long as music as a medium has existed, there has been someone there to mock it. As soon as someone wrote the "Seikilos Epitaph" (the oldest surviving musical composition in history), someone most likely wrote their own version using burps and fart noises. In fact, the word parody comes from the Greek paridía meaning, a "burlesque poem or song," showing the word's deep relationship to music. Yet, throughout all of that history, there has never been parodist quite like "Weird Al" Yankovic. Few other novelty artists can attest to such a long, varied career. Even so, Weird Al's humble beginnings found him hard-pressed to find an audience, as record executives falsely believed his appeal wouldn't stay. Fast-forward 30 years, 14 studio albums, 47 singles and 54 music videos, and Weird Al has outlasted many of the artists he's parodied, all of which has gained him four Grammy Awards, plus another 11 nominations, four gold records, and six platinum. Despite such accolades, it wasn't until the release of 2014's Mandatory Fun that Weird Al got his first Number One™ album, which is also the first comedic record to reach the number one spot since Allan Sherman's My Son, the Nut in 1963. Mandatory Fun, which spoofed everyone from Iggy Azaela to Pixies to Lorde, will also likely be Weird Al's last traditional album. "Going forward, I'll probably be more focused on more single releases and possibly some EPs," Yankovic explains. "I finally fulfilled my album deal—I was contractually obligated to release albums since 1982—all this time later... The way the industry is going, I need to now be competing with everybody on YouTube that's doing funny songs and parodies. It feels like whatever I can do to be more 'of the moment' would be helpful." Other parodies Weird Al has tackled include "Another One Rides The Bus" (parody of "Another One Bites the Dust" by Queen); "Tacky" ("Happy" by Pharrell Williams); and "Eat It" ("Beat It" by Michael Jackson) among many others. As a personal courtesy, Weird Al always gets permission from the original artist before approaching a parody, despite that copyright law does not require him to do so. A few times, he's respected that no, including the time he wanted to transform "Live and Let Die" into "Chicken Pot Pie." Paul McCartney, being a vegetarian, politely declined. Yankovic, who is vegan himself, understood. Weird Al also writes original songs, often pastiches of a particular band or genre. Plus, there's Yankovic's infamous polka medleys of popular songs mashed together —"The Alternative Polka" with portions of Nine Inch Nails, Green Day and Beck songs is particularly outrageous. "The germ of that [polka medley] idea came to me in college when I would play campus coffee houses. It was me on the accordion and my friend Joe Miller playing bongos," Yankovic recalls. "The highlight of our set was we would do a medley of every song ever written in history of the world. Which, obviously it wasn't really, but it was about a 20-minute-long medley of everything from the scene from 2001 to songs from Mary Poppins and 'The Odd Couple' and just very random, random songs segueing from one to the other. At every segue the audience would go crazy because it was so bizarre and random." Rather than outright mockery of the artists, Weird Al's absurd lyrics tend to juggle themes like nerd culture, junk food, hamsters, cartoons and other mundane aspects of everyday life. Rarely does Yankovic drop sexual innuendo, scatological turds or drug references; he never swears. In part, this attitude comes from Weird Al's religious background (he was raised Jewish and identifies as Christian), but it's also the sign of a more gifted creative mind. In other words, it's easy to write poop jokes, but getting laughs out of things like his pancreas, spam and the Amish requires more talent. Furthermore, it shows heckuva lot of integrity, such as the time Yankovic turned down a $5 million deal endorsing Coors Light. Weird Al rarely drinks. The comedian and musician's bizarre, glimmering humor also extends to the silver screen. In addition to writing and starring in the 1989 cult classic UHF, he also hosted the short-lived "The Weird Al Show," appeared on "The Simpsons," "Robot Chicken" and "Yo Gabba Gabba." But weirdest of all was perhaps his seven appearances on "Tim and Eric Awesome Show, Great Job!" as Uncle Muscles. Oddly enough, it was actually Yankovic who sought out Tim Heidecker and EricWareheim by hitting up his old buddy Bob Odenkirk of "Mr. Show" and "Breaking Bad" fame. "I found that there's no middle ground with [Tim and Eric's] fanbase. 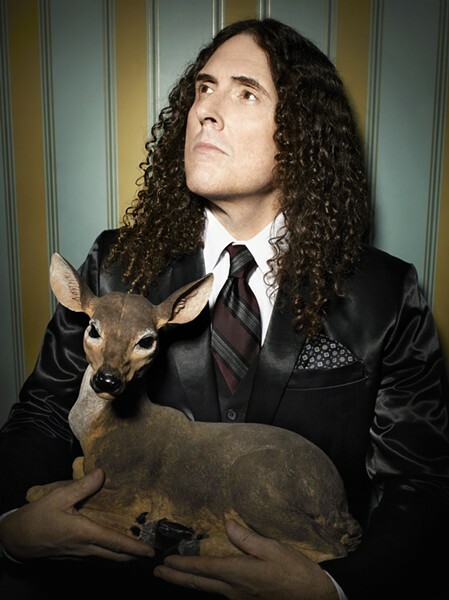 People either love them or hate them, there's nobody that's really lukewarm about them," Yankovic tells us. "The LA comedy community is very tightknit and you tend to bump into each other a lot ... [Odenkirk] and David Cross had an office directly across from me. I was doing the 'Spy Hard' opening sequence. So I got to listen to he and David Cross coming up with dialogue for 'Mr. Show' while I was working on my video." When people heard Mandatory Fun would be Weird Al's last album, many incorrectly believed he was quitting showbiz, leading to rumors circling the Internet. But, like it or not, Weird Al has no plans to go anywhere. Yankovic explains: "That certainly doesn't mean I'm retiring. I'm hoping to continue recording music, I hope to continue touring for as long as I'm physically able and for as long as people will allow me to do that, so I'm absolutely not planning to ever retire of my own free will. ".